TANDAG CITY, Surigao del Sur, Jan. 31 (PIA) -- The 165 newly promoted officers and men of Surigao del Sur Police Provincial Office (PPO) have taken their oath and got pinned with a rank higher during a flag-lowering rites at said office recently. According to P/SSupt. 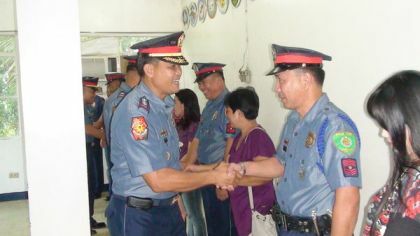 Arthur Sanchez, the mass promotion effective December 31, 2011 was based on General Orders Nos. 178, 179, and 180 issued by PNP National Headquarters for Police Commissioned Officers (PCOs) and Special Orders Nos. 20 – 48 from the Police Regional Office (PRO 13) in Caraga for Police Non-Commissioned Officers (PNCOs), respectively, pursuant to Section 33 of R.A. 8551. Sanchez said, 12 officers have been promoted to a rank higher, two of which got the rank of Police Chief Inspector while 10 earned the rank of Police Senior Inspector.